Thanks so much for your interest in the Southern Crescent Chorale. We are excited about our seventeenth season. We have so much to celebrate! First of all, we celebrate our faithful donors and patrons who give us the opportunity and the resources to make the music that we all love. All of our spirits are lifted each Monday evening as we work together to produce the sounds of quality choral music. Our devoted Board of Directors and Board of Advisors also give us reason to celebrate. 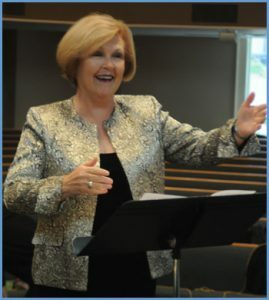 Their business savvy, community involvement, and dedication to the Chorale provide us with all that we need to make the Chorale a driving force in our community’s arts scene. Finally, we celebrate the exciting season ahead of us and look forward to sharing beautiful music with our communities, families, and friends. Let me tell you what we have in store. We begin with our annual season opening Gala on Friday, October 19, at Glendalough Manor in Tyrone. This is a very special event each year, truly a celebration in itself, and a great opportunity to hear the Chorale and enjoy dancing to the great sound of Second Time Around Band. The Gala theme, “Masquerade”, is an elegant evening including a cocktail hour, a delicious dinner, a Chorale performance and a silent auction. So mark your calendars now and plan to join us for dinner, dancing, music, bidding and fun! Our popular Christmas Concert will again be a wonderful way to start your holiday season. Accompanied by a full professional orchestra, the Chorale will sing many holiday favorites. The Chorale returns to Spivey Hall on Saturday, March 9 where they will perform an evening of great choral music celebrating Song and Dance. This concert will feature several choral classics. You won’t want to miss this spectacular concert performed in one of the world’s finest concert halls. On Saturday, March 16, we are proud to continue our tradition of benefit concerts with a concert benefiting Christian City Children’s Village. SCC will collaborate with the Masterworks Chorale and East Coweta High School choirs to present an evening of splendid choral music. We will wrap up our season with a fun evening of music under the stars at the Southern Ground Amphitheater in Fayetteville on May 11, when we will present “We Are Family”. Please see our Concert Schedule for complete details about our season. We’ve planned something for everyone and hope you will help us spread the word about the Chorale. Most of all, we hope you will join us as we celebrate the wonders of choral music this season! We depend upon gifts like yours to fund approximately half of our annual operating budget. Your generous gifts truly make a difference!